Last week, a friend of mine asked me: ‘NLP, I got the acronym, Neuro Linguistics Programming, but what is all this about?’ So here I am, picking up the challenge to condense in a few words how I understand NLP, and more important how this benefits the individual . I guess then I need to go back to basic, and for this, I particularly like this small diagram, widely used within NLP sites and training (NLP communication model). You can see there that an individual’s behaviour is generated from his/her state (also called emotions) which is linked to the current physiology of the individual and his/her internal representation(s). 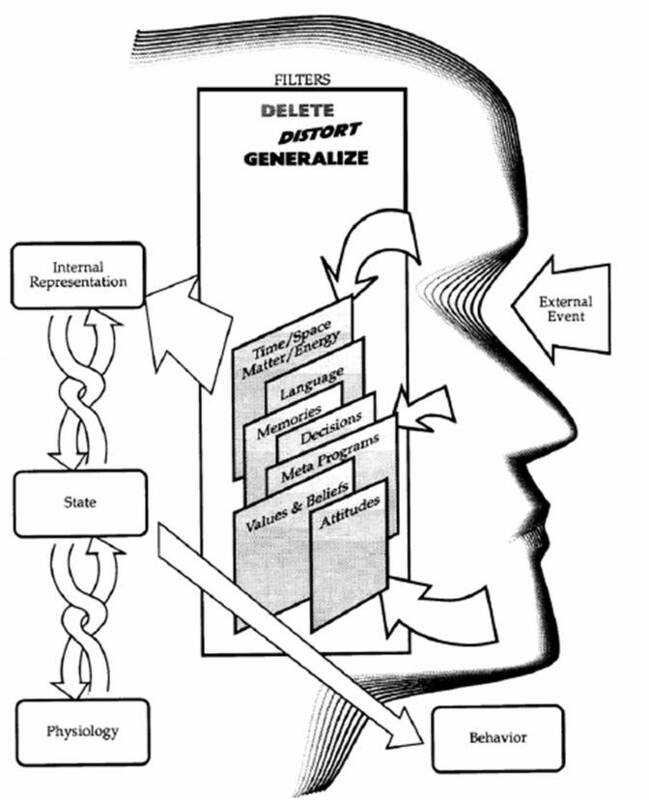 Those internal representations, triggered by external events, are created following the application of a set of filters (including metaprograms) specific to each individual that I will call ‘the individual own version of the world’. NLP is ‘simply’ helping individuals to understand the link between Neuro -‘how one thinks’-, to the Linguistics -‘how one speaks’- and the Programming -‘how one acts’. By understanding the set of filters one applies, one can modify this and achieves a more satisfactory behaviour. NLP supposes a major premise, ‘All… learning, behaviour, and change… are unconscious,’ and also includes a list of pre-suppositions, the key ones for me being: ‘Respect the other person’s model of the world’, ‘People are not their behaviour’, ‘Everyone is doing the best they can with the resources they have available (at that time)’, ‘The map is not the territory (or the words we used are not the event or the item they represent)’, ‘People have all the resources they need to succeed (they may not be aware of it at that specific time)’. Historically NLP is very interesting as it did not claim to create something new or re-invent the wheel. It did leverage from the existing fields of psychotherapy -linguistics, Phenomenology/Constructivism, Psychoanalysis, hypnosis and behaviourism-, the co-founders, Richard Bandler and linguist John Grinder, starting the creation of NLP by modeling very successful therapists in their field, like Eric Milton (hypnotherapist), Virginia Satir (family therapist), Fritz Perls (Gelstad therapy), Sigmund Freud (psychoanalysis), Carl Jung (psychoanalysis) and Pavlov (behaviourism), to cite a few. I will here refer to Lisa Wake and her ‘Map of the influences on NLP’ as well as her ‘Map of the History of NLP’, as a good summary (http://books.google.ie/books?id=oahwVEXfmNwC&pg=PA7&lpg=PA7&dq=lisa+wake+map+of+influences+on+NLP&source=bl&ots=M32yn2Re8v&sig=uQjYdddskDDh5yzuI9AM4zXcH08&hl=en&ei=o0_mTZ2NKY22hAfV1ry0Cg&sa=X&oi=book_result&ct=result&resnum=1&ved=0CBkQ6AEwAA#v=onepage&q&f=false) . NLP is then an extremely powerful method as it empowers the individual (assuming individuals have the needed resources within themselves) and it focuses on the outcome and solution (the desired behaviour). For instance, you cannot make someone feel good, however you can assist the person in accessing their own resources, which they have identified as being needed, in order to start feeling good. As a result, the NLP practitioner is not there to fix the individual, but only to act as ‘an agent of change’ (Richard Bolstad, Resolve) by enabling the individual to access the solution within themselves.